There's a lot to consider when choosing a satellite platform-from Quality of Service, to terrestrial network integration, and data security. The challenge is to find a platform that addresses the diverse requirements of vertical markets and the unique needs of a particular company. Some companies need a dedicated, point-to-point link, others want to share bandwidth dynamically across multiple locations. Add in specific satellite bands, topologies or demand specialized functionality like portability, durability or mobility and it becomes clear that a flexible approach is required. 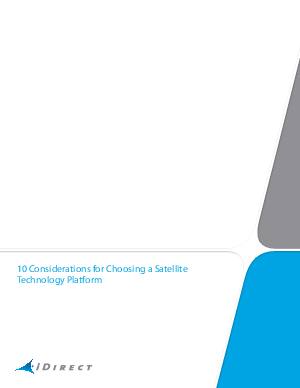 This informative report offers insights on how to evaluate a satellite platform and choose a vendor that can support a breadth of connectivity needs. Learn what considerations are critical to a successful deployment-including architecture, design, bandwidth and operational efficiencies-as well as the importance of customer management and brand strength. Understand your options with this must-have list of criteria that can help ensure the success of your satellite deployment. Download the report.